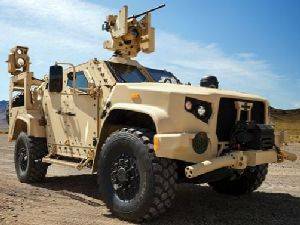 OSHKOSH, Wis. -- Oshkosh Defense, LLC, an Oshkosh Corporation company, announced today that the U.S. Army has placed another order for the Joint Light Tactical Vehicle (JLTV) program, including 611 vehicles and 1,789 installed and packaged kits. The order, valued at more than $177 million, is the sixth order for JLTVs since the contract was awarded in August 2015. “The Oshkosh® JLTV provides new levels of protected mobility, off-road capability, and transportability that is simply unseen on today’s modern battlefield,” said Dave Diersen, Vice President and General Manager of Joint Programs at Oshkosh Defense. The Oshkosh JLTV is intended to replace the U.S. Army and Marine Corps aging up-armored HMMWV fleet. Designed more than 35 years ago to transport troops and equipment in non-combat environments, the HMMWV failed to evolve to meet new threats and changing tactics, leaving Warfighters vulnerable to attack. As the battlefield threats change, so should the fleet to support new missions.